We’re back!! Apologies for our recent absence, enforced on us by the combined efforts of two of the most stupid web hosting providers in the known world. Your favourite website is back just in time to push the message that our next production, The Merry Wives of Windsor, starts in two weeks time. Directed by the rather wonderful Vin Adams, it promises to be a night of love, laughter and an old bloke with a beard, so buy your tickets now. 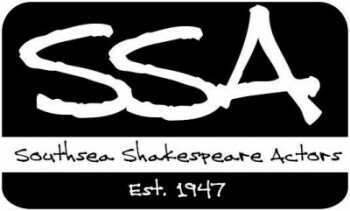 Whilst we’re talking about the website, we are working on a brand new look and feel to deliver all your favourite SSA news in a slightly less black and white way! Watch this space for further updates. Congratulations to Rob and all the cast of Cabin Pressure. Presented as a radio play, this was a hilarious night with smoothness, stupidity and sass in abundance! Thanks to all of you who attended the AGM and the workshop afterwards. It was lovely to see Len Russell, a member of the SSA since 1950 and one of our life members, and to hear some of his tales of the early days of the company. That nice Mr Downes is running another workshop on Monday 8th June, so be there! The SSA AGM will take place on Tuesday 19th May 2015 at 7.15pm. It will be held at our HQ in Omega Street and will be followed by a workshop led by Vin Adams starting at around 7.45pm, so please attend and make both events a success! Congratulations to the cast of Songologues II – The Best of British, excellent reviews and a great night for all! The SSA was well represented at this month’s Southampton Echo Curtain Call Awards. For last spring’s production of Macbeth, Danny Carter was nominated for Best Supporting Actor for Macduff , whilst Rob Bartlett’s Macbeth and Karen Gregory-Reader’s Lady Macbeth were nominated for Best Actor and Best Actress respectively. Neil Gregory-Reader also picked up a nod for his direction of the Scottish play. Matt Gibbins was nominated in the Best Actor category for Mercutio in November’s Romeo and Juliet, and Rob Bartlett got a nomination for directing the tale of the two doomed lovers. Huge congratulations to all our nominees, it’s great to see the SSA being so well represented, and whilst it’s a shame that they couldn’t all be winners, it’s extra applause time for Danny, Neil and Matt who came away from the awards ceremony with the winner’s trophies in their hands. The Songologues is back, and this time it’s the “Best of British”! Loads of SSA types have been auditioning for this production, which will take place in early April. There’ll be more details on the website soon! Congratulations to Aaron Holdaway, for winning the Best Amateur Actor category in The News Guide Awards, fantastic recognition for a great performance! It’s Awards Season once again, and we have 3 SSA nominations in The News Guide Awards. Aaron Holdaway has been nominated in the Best Amateur Actor category for Comedy of Errors, whilst both Macbeth and Comedy of Errors have been nominated in the Best Amateur Drama Production category. Huge congratulations to Aaron and to all the cast and crew of the two productions, and a message to all of you – ignore Russell Brand, and get voting! Mr Bartlett has pulled it off again! Congratulations to Rob, Jackson and all the cast and crew for Romeo and Juliet, which ran at the Station Theatre earlier this month. As a cast member, your humble webmaster can’t be objective about this, so I’ll just say it was a load of fun to be in and it fully deserved the great audience reactions and reviews it received. Chris and Phoebe stole the show and broke hearts as the star-crossed lovers, and there was some great servant acting by the Capulet crew, shame about those mangy Montagues! Songologues is back – January 13th and 14th sees the return of the SSA to Rosie’s Vineyard to perform this popular piece. Ticket details will be published soon.